Having been a mom for over two decades, I have experienced survival mode intimately several times. Everyone is susceptible to becoming overwhelmed—too busy and too tired to have any hope that things can ever improve—but there’s something about being a mom that seems to invite this condition. One mom who has overcome survival mode is Crystal Paine. 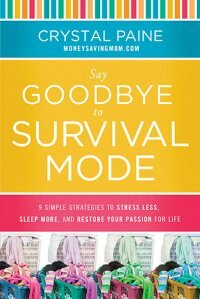 In Say Goodbye to Survival Mode, she shares 9 Simple Strategies to Stress Less, Sleep more, and Restore your Passion for Life. Having gone through post-partum depression, financial stress, and burn out herself, Crystal lets us peek into her world as she realized that she was destroying her own life by trying to do it all. She learned to stop and to focus only on the best. That is truly the key to learning to thrive. But of course, ‘focus on the best’ is not a very hands-on piece of advice. So Crystal gives checklists for figuring it out what ‘the best’ is for us right now. Then she gets practical and talks about goals and the value of cultivating small, daily habits that can change our lives. Of course, since she is the Money Saving Mom she discusses being intentional with money, too. She also outlines her struggles and solutions with regards to household management. Personally, I think that when we’re meeting goals in all these areas, we’ve made our life a whole lot more peaceful already. But of course, life happens. Goals do not always get met even if we work at them, and a ‘perfect’ life can fall apart in an instant. So, what if we feel like a failure? Many women struggle with negative self-image and can talk themselves into feeling like losers although everyone else admires them. In fact, Crystal tells the story of reading the blog of a supermom and wishing she could be like her; then she was shocked to discover that the supermom she envied wanted to be like her! Life lived for oneself is not only wrong but is also very empty. Crystal encourages the barely surviving person that he or she can make a difference to others. It does not take a lot of money or time or energy to brighten someone’s day, and it can make our own more cheerful too. All these ideas will help us to say goodbye to survival mode, but there’s one more aspect of life that we moms often have trouble with: taking care of ourselves. From bitter experience, Crystal points to the importance of finding time for Bible reading and prayer, of focusing on our husbands, of emphasizing friendships, and of physical self-care such as rest, relaxation, healthy eating, reading, and fun. I would not call some of these ‘self care’, but I agree with Crystal that they are crucial to life. Did Crystal say anything really new in this book? Not at all, but she packaged it in her own enthusiastic, transparent style. If you like the inspirational posts she writes on MoneySavingMom.com, you’ll love this book. This book has meant a lot to me. With better health, many new opportunities, and only three children now left in our homeschool, I have been trying to re-evaluate the things I do. So, although I am not in survival mode, Crystal’s book is becoming a theme of my year as I ponder goals, habits, routines, failures, and how God wants me to serve him. If you, like me, thrive on the occasional Christian motivational book and want to make sure your daily activities and choices are wise, you will enjoy Say Goodbye to Survival Mode. And if you are in survival mode, you probably desperately need it. I highly recommend this book and wish you God’s blessing as you ponder how to live your life wisely to God’s honor rather than just surviving it. For some other views on the issue of thriving, I highly recommend Balanced by Tricia Goyer, Pilgrimage by Lynn Austin, and One Thousand Gifts by Ann Voskamp (links are to my reviews). Balanced is a God-centered book about trusting God to know what is best for us, finding our center in Him, and realizing that the overarching goal of our life is Jesus, not all our other goals or even balance itself. Pilgrimage brings Biblical comfort and encouragement to the hearts of women facing unwanted change. And One Thousand Gifts shows, with heartrending honesty, that the path through despair and deep questioning is gratitude. 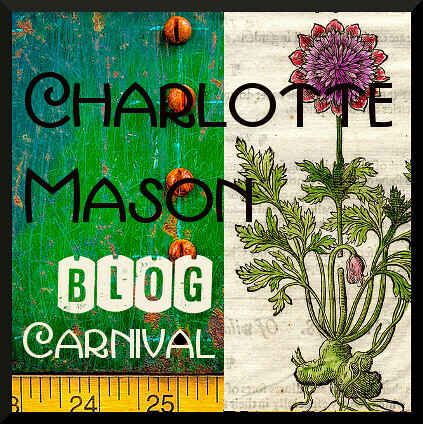 This is yet another book in the in the 2014 52 Books in 52 Weeks Challenge, and is also linked to Saturday Reviews, Works For Me Wednesday , Raising Homemakers. Disclosure I received a free review copy of this book from BookLook Bloggers in order to share my honest opinions. 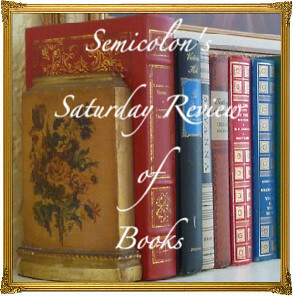 Posted in: 52 Books in 52 Weeks, Life, Reviews, Reviews: Nonfiction.